Explanation: The star cataloged as NGC2264 IRS is normally hidden from the inquiring gaze of optical telescopes. It resides in the midst of the obscuring gas and dust of a nearby star forming region popularly known as the Cone Nebula. Imaged in penetrating infrared light by the Hubble Space Telescope's newly operational NICMOS instrument, this young and massive star was found to be surrounded by six "baby" sun-like stars - all within less than a tenth of a light-year of their "big brother". 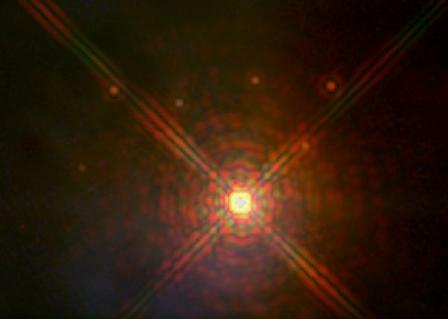 The diffraction spikes and rings surrounding big brother are image artifacts. Astronomers believe that the high speed winds generated by the massive star compressed nearby material causing the formation of the smaller stars in a text book example of triggered star formation. The newly created suns appear to lie along an otherwise invisible boundary where the high speed gas has collided with the wall of a denser molecular cloud. 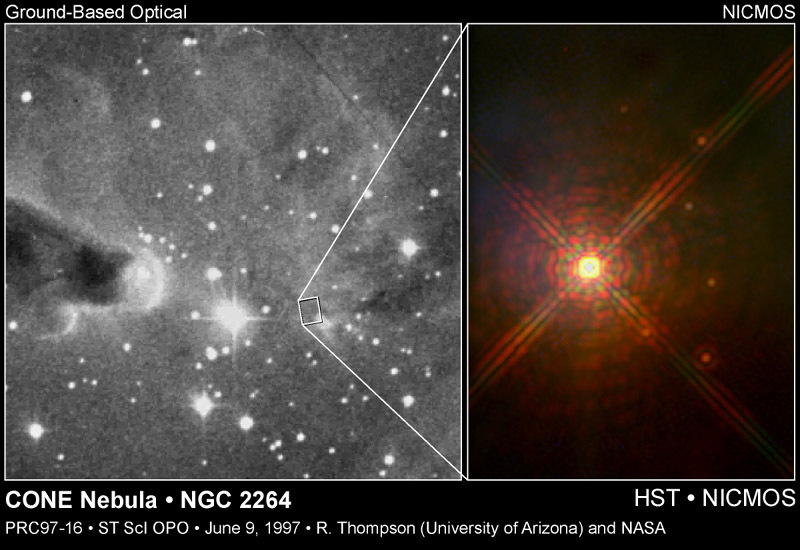 NGC2264 IRS also seems to be the source of the outflow which created the striking cone shape of the optical nebula.